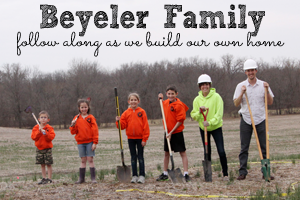 Building Beyeler Hollow: Day 136: Framing Begins! It's official. 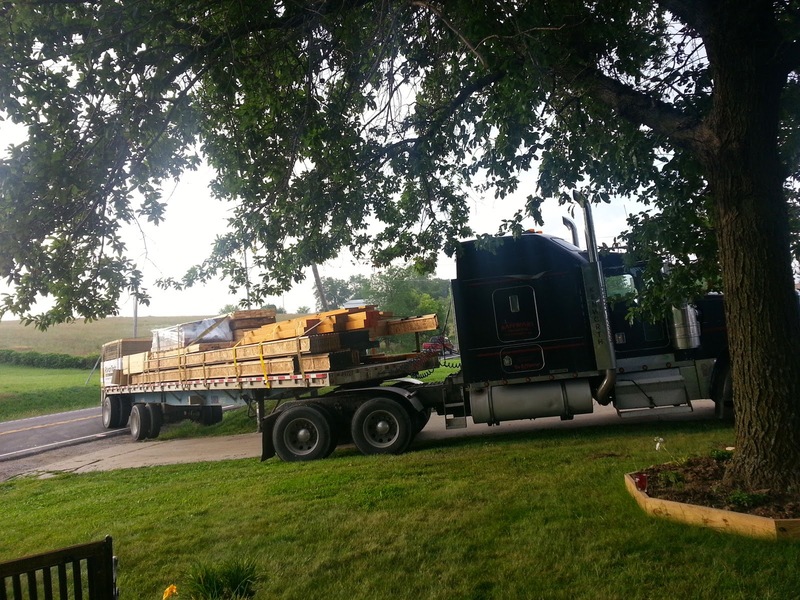 Our house package has arrived and framing has begun! As a reminder, we're building a foam house. 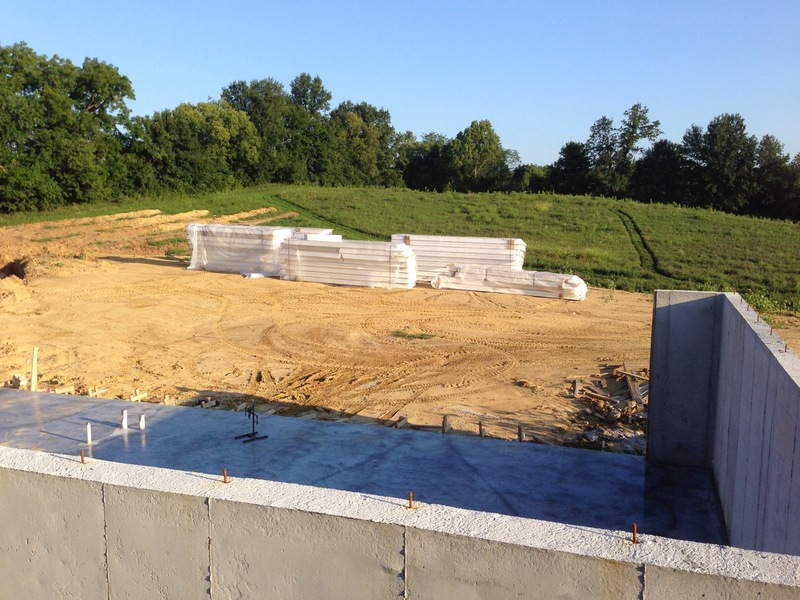 Foam, as in, Structural Insulated Panels, or SIPs. These panels consist of a sheet of OSB (think plywood), a 6-10 inch layer of foam, and another sheet of OSB. The panels are pre-cut by a CNC machine in a factory and then shipped to the job site. My panels are from a company called EPS, and were shipped from New York because the Missouri plant was full. I also purchased all of my other materials from EPS (lumber, BCI joists, floor, etc). All of the SIP sections and other materials arrived Monday and Tuesday on 5 semis. 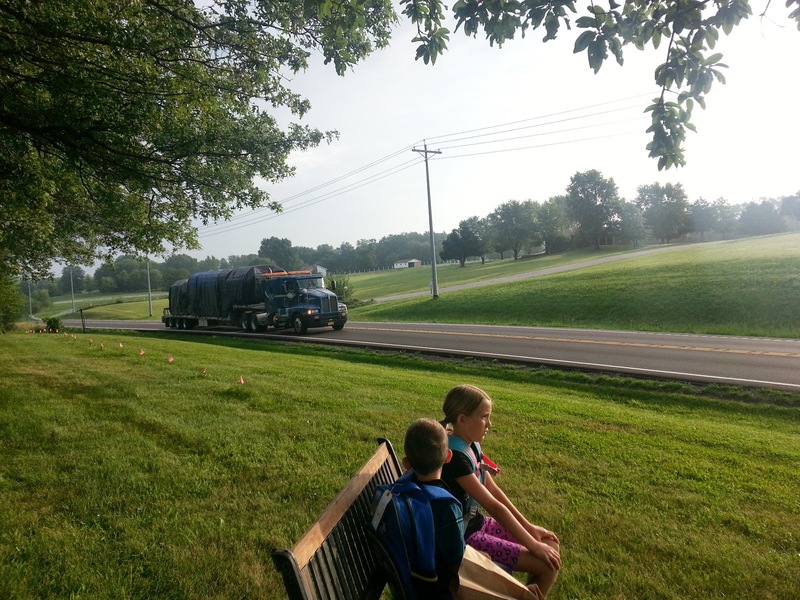 The kiddos were waiting for the bus stop when the trucks started rolling in. Mind you, the driveway is a bit narrower than the drivers would have preferred. After some finagling, and deciding to come in from the other direction, they were able to pull in. Only one mailbox was harmed in the process. The panels were stacked around the job site in about five piles the size of the ones below. 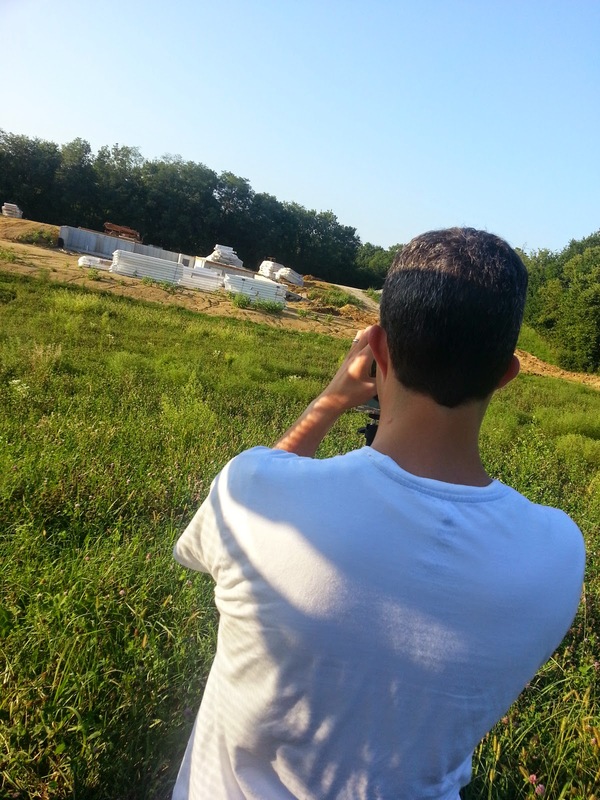 Here is me adjusting the time-lapse camera across the way. You can see the piles of panels surrounding the job site. 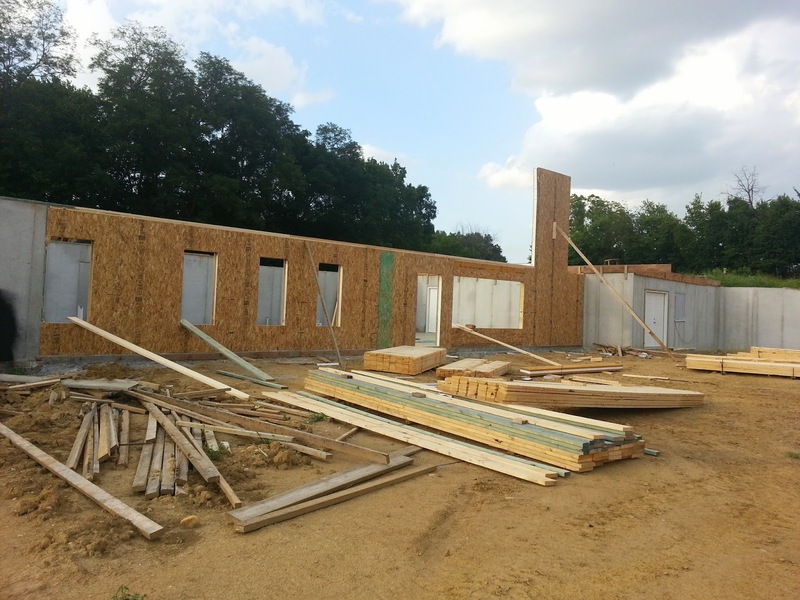 With the panels now on site, framing could begin. 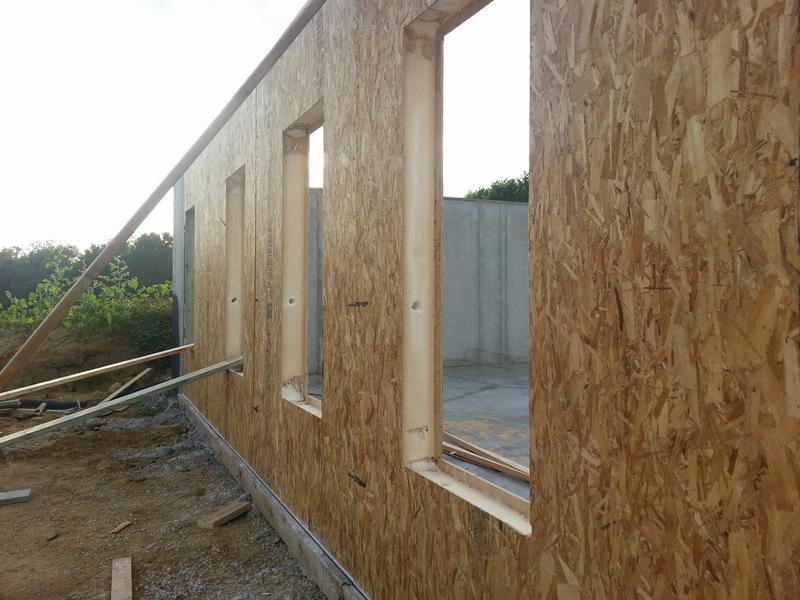 Framing is a bit of a misnomer, since it's not just the frame going up, but the walls and insulation as well. The pictures below shows the back wall of the basement. We're excited to start seeing it come together. If you look closely at this picture you can see the structure of the panels and the foam inside. You can also see the holes in the foam, which are "chases" for wiring.